We all go gaga over sports cars, luxury sedans and SUVs that cost many multiples more than an average home. But when it comes to actually buying the car of your dreams, a more realistic dream - one that 90 per cent of the car buying public can aspire to -, mostly everyone arrives at the D2 segment. For a majority of white collar folks in this SUV loving country, these SUVs inspire a majority of those ambitions. 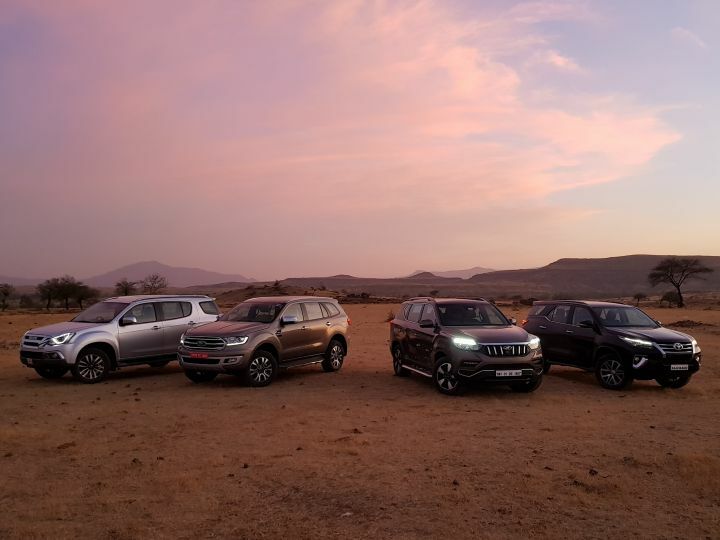 The Ford Endeavour, Toyota Fortuner, Mahindra Alturas G4 and the Isuzu MU-X are all SUVs in the truest sense. These ladder framed monsters can intimidate minions out of their way in the city and won’t bat an eyelid when called up to wallow in the mud either. The freshest face of these four belongs to the Alturas G4. It’s based on the second generation Ssangyong Rexton with a big bold Mahindra chrome grill to make it more familiar. It’s also the largest SUV in this test and its straight shoulder and roof lines, large open toothed grin and chunky alloy wheel pattern further emphasises that. It’s packed with features, quilted leather upholstery, and a new 7-speed transmission sourced from Mercedes-Benz. It’s sheer road presence alone is enough to inspire. The 4x4 variant we have on test retails for Rs 29.95 lakh (ex-showroom Delhi) which is just a tad more expensive than the MU-X but the 4x2 variant only starts at Rs 26.95 lakh and has the lowest asking price of the four. The Ford Endeavour is the most recently updated SUV of the lot and this 2019 model year update has given the big American some added oomph on the inside, but has changed very little on the outside. It joins the ranks of Ford’s spot-the-differences “facelifts” that we’ve been witnessing of late. That said, it’s still one of the nicest looking SUVs in our books and even though it does feature a lot of rounded edges, there is a certain butchness that gives it great road presence, but keeps it likeable at the same time. This 4x4 Titanium Plus will set you back Rs 32.97 lakh. The Toyota Fortuner sports the most modern SUV design in this bunch. The bold chrome accents and sharp angular headlamps up front and the smooth shoulder line that steps up before meeting with the C-pillar give it a distinct youthfulness. But in the company of the Endeavour and the fresh looking Alturas G4, the new Fortuner loses some of its sheen. Another surprise when we looked at the numbers - the Fortuner is also the smallest of the lot. Its sales number though show that it’s still as desirable as it was on day one. It's also the most expensive here at Rs 33.28 lakh. And the outlier in this test is the MU-X. It also received a facelift to bring it up to date with the international model. Like the Endeavour, it’s also a blink and you miss it kind of a deal with a new pattern for the 17-inch alloy wheels and the repositioned DRLs which have moved from near the fog lamps to above the headlights. Strangely, Isuzu hasn’t given us the new 6-speed gearbox that international markets get. Yes, we’re sure the MU-X doesn't feature in too many folks’ REM cycles, but that’s the whole point of including it. With its solid reputation for reliability, maybe this quiet Japanese wallflower should be enchanting more of us. The 4WD that we have here retails for Rs 29.32 lakh, making it the least expensive here. With a price bracket ranging from Rs 29-33 lakh, each of these SUVs should be packed with features. And for the most part, they are - touchscreen infotainment systems, multi-speaker audio, electric seat adjust, multi-zone climate control, leather seats, 4x4 drive systems, electric folding rear view mirrors, multiple power outlets, are standard fare on all of them. Safety wise we’re looking at six airbags in the Fortuner and the MUX, seven in the Endeavour and nine in the Alturas G4. But the four split into two groups when it comes to the length of their features lists and the quality inside. The Endeavour and the Alturas G4 are the most recently updated vehicles and hence sport more comprehensive packages, while the MU-X and the Fortuner’s lists are a little shorter. The Mahindra Alturas G4 is a pleasant surprise. Like the Fortuner, it’s also a classy space to step into, but it feels more modern and there seems to be a certain European sensibility to the layout. The quilted nappa leather looks and feels great and we simply loved the vented front seats. Other equipment highlights include the 360 degree camera, sunroof, a feature rich TFT LCD driver’s information display, automatic tailgate, memory function for front seats with an easy access mode, nine airbags and the six-speaker infotainment which also features Android Auto and Apple CarPlay. It does have some strange omissions on an otherwise long features list like the manually adjustable passenger seat and a manually adjustable day/night IRVM (even the XUV300 gets an auto dimmer!). We also found that a lot of the buttons and switches feel a little delicate and one of the rear aircon vents actually popped out while we were adjusting it. So it doesn't come across as being as built-to-last as the MU-X for instance. The Mahindra Alturas G4 ticks a lot of boxes when it comes to a flagship SUV. It’s the plushest of the lot with acres of space (for five) and the only one to offer cooled seats. It’s hard to ignore it when the 4x2 variant is also the least expensive in this group.